A wide assortment of odometer transducers (sensors), custom firmware options, special application hardware, and installation accessories are available for use with the above products. These items are shown on the Timewise price list. Click here to download this two page PDF formated document. You will need Adobe Acrobat Reader to view a PDF formated document. The Ordering page has a link to the free Acrobat Reader. 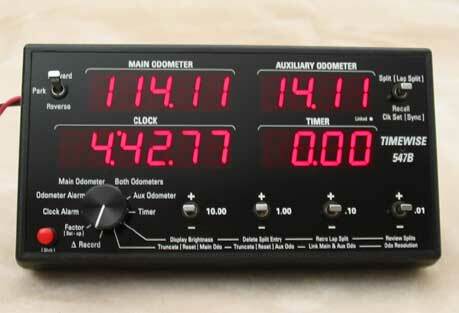 The TIMEWISE 547B rally odometer is designed for either "Pro-rally" stage events or limited "B-class" TSD road rallying. Dual odometers, time of day clock, and independent timer provide precise time and distance information for the navigator. Non-slip toggle switch actuators give positive operator feedback, and a single rotary switch eliminates an array of closely spaced function select pushbuttons. An optional remote display can show speed or distance information to the driver. All parameters are shown on ultra-bright, 0.6" tall LED displays. 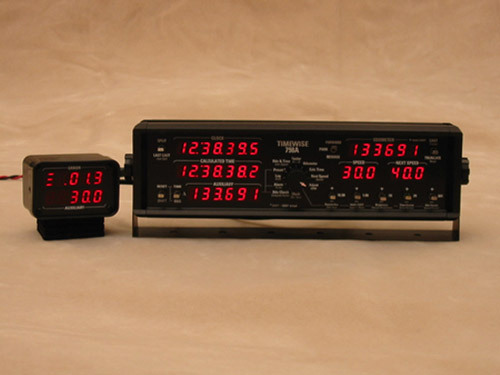 The timer and auxiliary odometer can be Taylor split (simultaneously split and internally reset to zero) for incremental measurements. The 547B includes a datalog memory that saves the most recent 250 splits. All parameters, including the odometer factors and personal setups, are automatically saved in non-volatile memory when power is removed from the 547B. An optional battery-backed real time clock is available. Contact Timewise for pricing, a list of available predefined options and odometer input sensors, and to discuss your customization requirements. 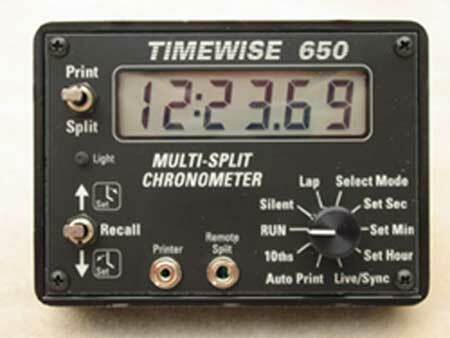 The TIMEWISE 650 rally clock provides rallymasters, rallyists, and checkpoint workers with an accurate and easy to read digital time of day clock. The time of day is shown on a six-digit, 0.5" tall, extended temperature range LCD that assures easy readability, even in direct sunlight. Time is displayed in either a "seconds" or "hundredths of minutes" format, with optional tenths of units. Fifty split times are saved for later review. Model 650 is no longer available and will soon be replaced by Model 660. Contact Timewise for more infomation. The TIMEWISE 798A rally computer is designed for "A-class" TSD road rallying where unlimited computerized measuring equipment is permitted. Dual independent odometers, time of day and calculated time clocks, highly resolved error readout, simultaneous distance and time adjustments, accurate speedometer, datalog, and many other features enable the navigator and driver to handle even the most difficult rallying scenarios. All course parameters are shown on ultra-bright, 0.4" tall LED displays. Non-slip toggle switches give positive operator feedback, and a single rotary switch eliminates an array of closely spaced function select pushbuttons. All parameters, including the odometer factors, time of day clock, data storage, and personal setups, are battery-backed. The 798A provides capabilities and benefits well beyond those of any other rally computer. Photo courtesy of Rally Partners Inc. 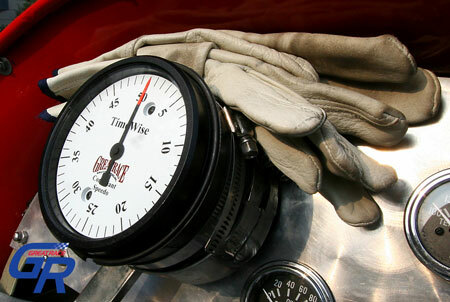 The TIMEWISE 825 electronic speedometer meets the strict design guidelines for use in the transcontinental antique vehicle Great Race road rally. A microprocessor driven stepper-motor provides accuracy and repeatability unobtainable with traditional mechanical speedometers. The maximum allowable diameter faceplate and fine point dial needle provide interpretable resolution of 0.05 mph. The Timewise 825 exhibits no variation in its reading with changes in temperature or humidity, or with time in service. A special Great Race package price is available consisting of a Timewise 825, a user's instruction manual, a Model 217-15 transducer, 5 ceramic magnets, and UPS Ground shipping. Please call or email for details. This site created and maintained by Trevor W. Hope. Please direct questions and comments regarding the layout of this site to the webmaster.